B'nai B'rith was instrumental in gaining U.S. support for the nascent Zionist state of Israel in the late 1940s. The Jewish secret society of Freemasons used President Harry Truman's friend - and their agent - Eddie Jacobson of Kansas City (standing behind Truman) in off-the-record meetings in the Oval Office to persuade the president to approve the Zionist land grab known as the 1947 U.N. Partition Plan of Palestine and then to recognize the state of Israel the next year following the Zionist ethnic cleansing of nearly 400 Palestinian villages and towns. By applying pressure directly on Truman, B'nai B'rith dictated U.S. policy in spite of strong resistance from the U.S. Department of State. When Truman extended de jure recognition of the Zionist state on January 31, 1949, the only guests invited to the signing ceremony in the Oval Office were members of B'nai B'rith: Eddie Jacobson, the B'nai B'rith executive vice president Maurice Bisgyer, and the secret society's president, Frank Goldman (sitting). President Truman, a highest level Freemason, was forced to accept the dictates of a gang of Zionist Jewish Freemasons on crafting U.S. policy in the Middle East. What does this say about the real hierarchy of power among Freemasons? Truman, a Freemason since 1909, had established the Grandview Lodge No. 618 in Missouri and served as its first "Worshipful Master". 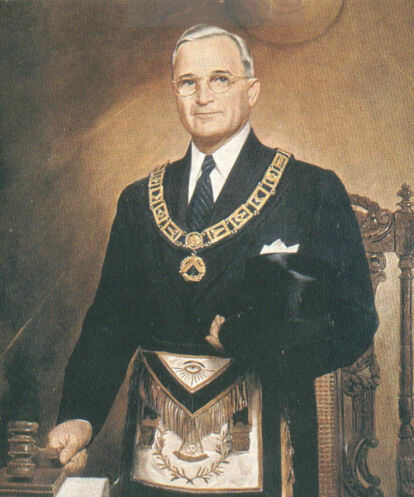 In 1940, Brother Truman was elected the ninety-seventh Grand Master of Masons of Missouri. In 1945, President Truman was made a Sovereign Grand Inspector General, 33°, and Honorary Member at the Supreme Council of the Ancient & Accepted Scottish Rite (A.A.S.R.) Southern Jurisdiction Headquarters in Washington D.C. The fact that Jewish Freemasons of the B'nai B'rith were able to meet secretly with the president in the Oval Office whenever they wanted and were able to direct the U.S. president, a highest level Mason, to follow their orders in shaping U.S. policy in the Middle East, shows the immense power this secret society of Zionist Jews has long had over the U.S. government and other Masonic orders. Barack Hussein Obama was cultivated as a politician in Chicago and made President of the United States by the power of the B'nai B'rith. It's high time for these secret societies to be removed from the corridors of power where U.S. policy is crafted. After one year in office it is clear that the Obama administration, elected on a platform of "change", is actually maintaining the policies of the Bush administration. In some cases, such as the occupation of Afghanistan, President Barack Hussein Obama has actually added to the war effort by sending tens of thousands more troops. The fact that the political change was only superficial and that the Obama administration intends to follow the basic policies of the previous administration can best be seen in the continuing cover up of the truth of what really happened on 9-11. The false-flag terrorism of 9-11 is the fundamental lie that needs to be protected. Upon this blatant lie the fraudulent "War on Terror" is based, and this illegal war policy has been embraced by Barack Obama. When the Obama team sent Henry Kissinger to Moscow for early meetings with the Russian leadership, rather than Secretary of State Hillary Clinton, it was evident that the power brokers running the Obama White House were the same as those that ran the Bush and Clinton administrations – and those before them. Rahm Emanuel, Chief-of-Staff of the Obama administration and son of an Israeli terrorist, and David Axelrod, the president's strategy chief and senior adviser, are two of the highest managers of Barack Obama. Axelrod, the son of a Communist Jew, has been managing Obama's political career since 1992. Emanuel, as a former senior adviser in the Clinton White House, was the person who pushed the disastrous NAFTA legislation through Congress in 1993. But who really manages Emanuel and Axelrod? Who tells them what policies to promote and which to discard? 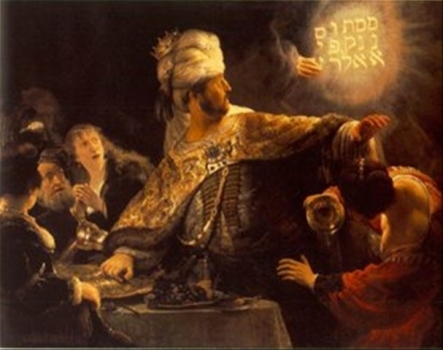 Our politicians and policies are given to us today via television and the controlled media like the mysterious writing on the wall appeared to Babylon's King Belshazzar, son of Nebuchadnezzar, in the Old Testament. But who controls the hand that creates the politicians and crafts the policies? The election of Barack Obama has provided us with a glimpse of the hidden hand that controls the government of the United States. The politicians and policies of the U.S. government do not actually come from the people but are presented to the public through the controlled media. The two most influential papers in the United States, The New York Times and Washington Post, are both controlled by German Jewish families that are among the founding members of the Jewish secret society the B'nai B'rith. The B'nai B'rith, an order of Jewish Freemasonry, is closed to non-Jews which puts its Jewish members at the top of the Masonic hierarchy. The members of B'nai B'rith are able to join other Masonic orders but only Jews can belong to B'nai B'rith. Barack Obama has been created as a political candidate since 1992 by David Axelrod and Bettylu Saltzman, the daughter of Philip M. Klutznick, the former head of B'nai B'rith International, the supreme body of the B'nai B'rith. This is the secret society of Zionist Jews that controls the White House and the policies of the U.S. government. The first Chicago newspaper report from the 1860s that revealed that a secret organization of "Israelites" had existed in Chicago for some 20 years. Secret anti-Christian organizations like the Freemasons and B'nai B'rith are like the fabled black holes of astronomy. Like other unseen astronomical bodies, astronomers postulate the existence of black holes based on how they distort light and affect other bodies around them. So is it with the Jewish B'nai B'rith and other Freemasonic secret societies, which we know very little about but whose presence can be seen in how they pervade every level of our society and affect everything around us. Great nations, like the United States, France, and Germany, once had anti-Masonic and anti-Semitic political parties that acted to challenge the pernicious influence of secret Masonic and Jewish organizations. Today we no longer have such political parties to counter these secret networks and find ourselves ruled by B'nai B'rith and Jewish Freemasons. In the United States in 1828, the Anti-Masonic Party was the original third party to be active on the national scene. Popular opinion in America was naturally opposed to secret organizations and people feared the Freemasons, believing they were a powerful secret society that undermined republican principles. The Anti-Masonic Party was right. A democratic republic that allows its government, courts, and media to be run by the members of secret societies will soon find that they have taken over the republic. This is what has happened to the United States. In 1843, a German Jew who called himself Henry Jones founded a Jewish secret society called the “Bundes-Brueder” (League of brothers) in the Sinsheimer Café near Wall Street in New York. Jones recruited his co-founders from the synagogue where he was in charge. At least four of its founders were Freemasons. The order, which was later re-named the “B’nai B’rith,” was closed to all non-Jews and to any Jew who fraternized with Christians. The power of the B'nai B'rith has grown immensely during the past 166 years. As an independent journalist who has investigated the evidence of Israeli involvement in the false-flag terror of 9-11, I have seen how this secret society of Jewish Freemasons is able to corrupt every aspect of American society. It is the force behind the media and government cover-up of the truth of what happened on 9-11. It is also the secret organization behind the brutal attack on me at my house in August 2006 and the malicious prosecution and corrupt court process that followed. 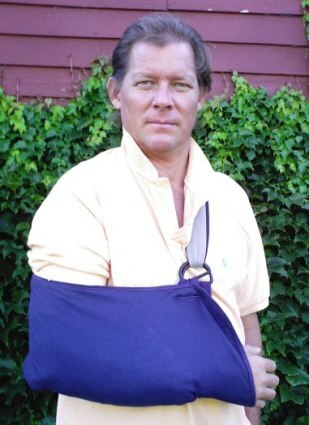 Christopher Bollyn the day after being brutally assaulted by a three-man undercover tactical police squad at his home in Hoffman Estates, Illinois, in August 2006.